Mariam’s sewing machine next to a wall of material. Monkey Bay, Malawi. I started at the “Cash and Carry” grocery store, where I quenched my thirst with three small bags of strawberry yogurt. The store was out of water, which wasn’t surprising. Not only was the temperature climbing up to around 100F with oppressively high humidity, but there was also a crippling fuel shortage in the country, which made it difficult for some companies to deliver to the more rural areas. Yet somehow, the vans and minibuses were able to find fuel, and they sat outside of the grocery store honking their horns like a seasoned New York cabbie and yelling their destinations to all who walked by. 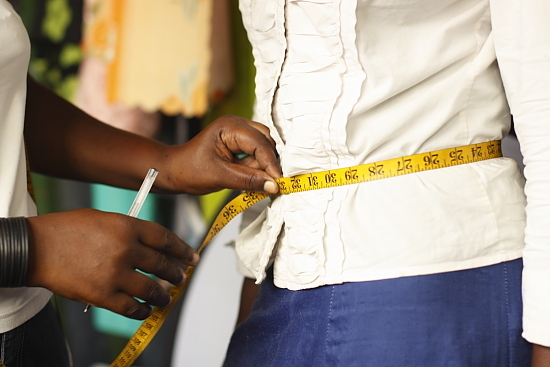 Mariam measures a customer for a dress. Monkey Bay, Malawi. I crossed the road and ducked under the low-hanging branches of a tree that partially conceals one of the entrances to the market. I followed the man from the grocery store who was going to introduce me to the best seamstress in town. We navigated through the narrow alleys, over broken mud bricks, and passed stalls that sell everything from freshly-made french fries to collared dress shirts and Chinese-made flashlights. Some men sat in the middle of the dusty paths with buckets of small fish, which gave off a very powerful stench because they had been sitting in the hot sun all day. I batted away the flies as I leaned against a wall to let someone else pass through the narrow walking corridor. I tried to pay as much attention to all the turns we made through the maze-like market because I knew I would eventually need to find my way back out. After a few minutes of walking (though it seemed like much longer due to the sensory overload), my impromptu guide stuck his head through the window of a small mud-brick building and called out a greeting to the smiling lady sitting behind a black sewing machine. Then he turned to me and beckoned me to enter. Poster of available designs. Monkey Bay, Malawi. 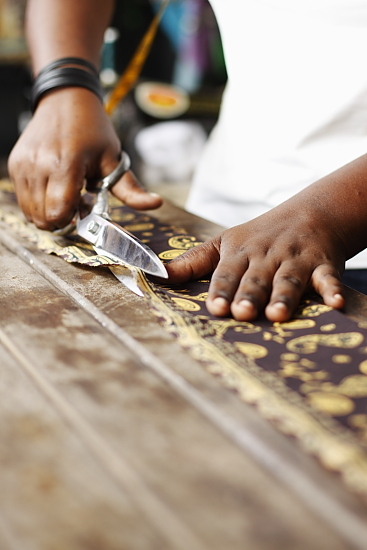 Mariam trimming the fabric. Monkey Bay, Malawi. The shop is small, only about a meter and a half by four meters. The store front, made up of one of the longer sides of the room, has a door (which is always open during business hours to let in light and air) and three large glass-less windows. A small bench and two wooden tables are pushed up against the windows so the seamstresses can use the natural light to complete their work. This is necessary because there is no electricity in the market. The long back wall of the room has shallow shelves from the floor to the ceiling. This is where scrap material, cut cloth for clients, and completed items are stacked and hung. Every once in a while, a stack would tumble onto the dirt floor. Along each short wall of the room, there is a manual sewing machine. Although the two machines are different makes, they are both foot-powered, basic Chinese-made black metal models. They both have detailed floral paintings and intricately etched steel plates which give them an old-world feel, even though their lack of chipped paint makes me think they are relatively new. Mariam uses her hand to help start the sewing machine. Monkey Bay, Malawi. 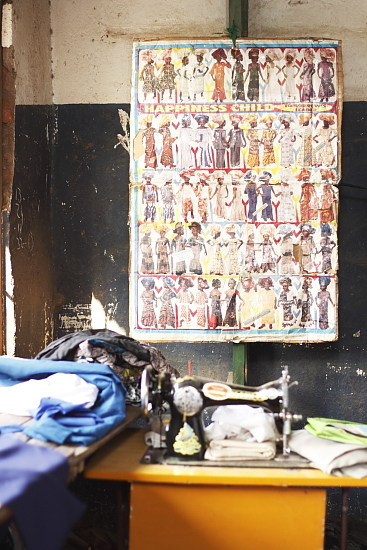 This is where Mariam Kawinga works as a seamstress. When I arrived, there were two other women sitting on the bench chatting with Mariam as she sewed a green school uniform. She stood up to greet me and inspect the bundles of material I had. She rubbed the material between her fingers as she said that. I haven’t noticed a difference between their feel, but I haven’t felt them both at the same time to make a proper comparison. The main difference I have noticed between Malawian and Tanzanian material is the design style. Tanzanian material better matches the Western stereotype of what African fabric should look like, employing bold designs, broad lines, exaggerated features, and bright colors (mostly black, brown, gold, green, and blue). Malawian material uses designs and patterns that borrow from the modern way of life, like my music themed material or the heart themed one mentioned in the DWS Mapeto entry. I’ve also seen patterns made of diamond rings and high heels. I don’t see this as making one country’s material better than the other, just more suitable for specific markets. 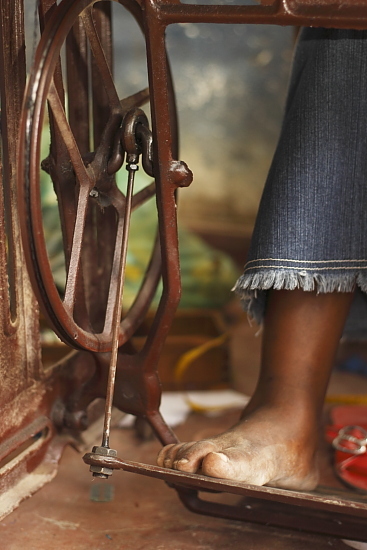 Mariam uses her feet to power the sewing machine. Monkey Bay, Malawi. I told Mariam that I would like a few skirts made from the material I gave her. She pointed behind one of the sewing machines to a large poster that showed a few dozen dress styles being modeled by a small child. I already had an idea of what I wanted the skirts to look like, so I was pleased when I was easily able to find two similar styles on the poster. One was advertised as a very popular style in Nigeria, but the other did not list a country of origin. Mariam nodded when I pointed out the two styles, then immediately went to work measuring my waist, hips, legs, and other measurements in between. I asked her to keep one of the skirts long, but to modify the other so it would reach my knees instead of my ankles. She laughed and shook her head, but obliged. She went back to chatting with the other people in the shop (and the ones in the alley who were intrigued by the appearance of a mzungu in the local market) as she unfolded and folded my fabric, smoothing out the wrinkles before making another fold. Some of the folds reminded me of origami. Each fold was made with precise lengths determined by the bright yellow tape measure that hung around Mariam neck. She marked out each fold and each measurement with white chalk. When she began cutting along all of the dusty marks, she used her tape measure to create perfect circular cuts by holding one end of the tape measure in one spot and spinning the rest around that point as she cut. Consulting her notebook to check sizes and orders. Monkey Bay, Malawi. 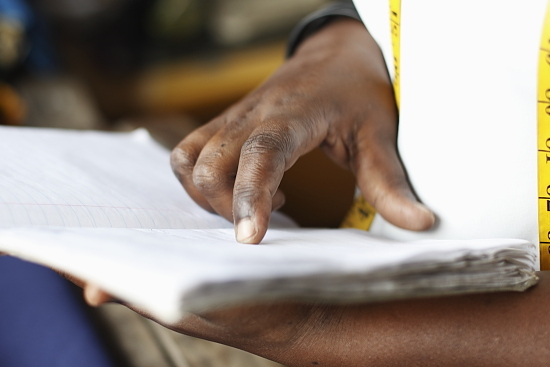 Her hands moved so deftly, measuring and cutting, and only glancing at the book where she wrote down my measurements once. She wore a black scarf wrapped around her head despite the heat. I had sweat dripping down my forehead within only a few minutes of entering the shop. The windows and the door were all opened, hoping to tempt a breeze, but there was not the slightest stirring of the air to help cool the room. 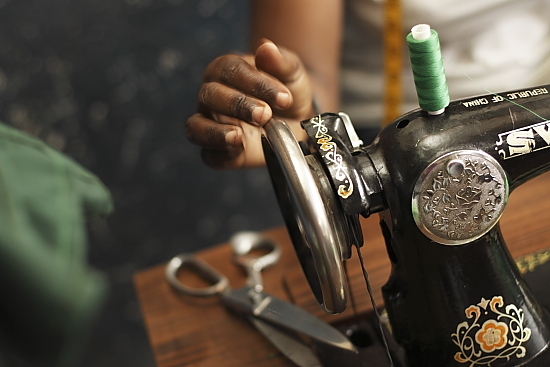 Mariam has been working as a seamstress for three and a half years. Her mother was also a seamstress. She did not learn how to be a seamstress from her mother, but from a trade school so she would have better qualifications. She has only one child, a daughter, but she says her daughter does not want to become a seamstress; she wants to become a lawyer. 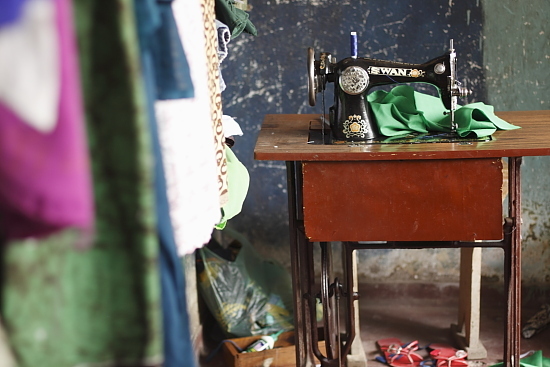 One of the reasons why Mariam chose to work as a seamstress was because she could earn more money doing that than many other jobs, and she needs the money to pay for her daughter’s school fees. She also uses the money to support her aging parents. She saves a little each month so she can buy a house. Mariam sewing a school uniform. Monkey Bay, Malawi. Mariam is bright and slightly shy. She laughed often when she chatted with her friends and customers, but every time her gaze returned to her work, her expression became one of intense concentration. While working at the sewing machine, she took off her sandals to protect them and keep them looking new. She was fascinated by my camera and insisted that I have my photograph taken with her. She laughed freely as she moved my head, shoulders, and arms into various poses for the pictures. When she finished cutting the material for my skirts, she returned to the sewing machine to finish two shirts before her customers came to pick them up. I stayed in the shop, watching, sweating, photographing, chatting, laughing, and entertaining with my broken Chichewa, until shortly before sunset. The temperature had only dropped a few degrees, but the absence of the direct sun on my skin made the bike ride home much more tolerable. I returned to the shop a few days later to pick up four beautifully made skirts. How many other people can say that they own a personalized skirt, let alone that they followed the production of those skirts from the raw cotton, through the spinning, weaving, printing, packaging, measuring, cutting, and sewing all the way to the finished product? That’s one of the best parts about living in a place like this where everything is made locally.